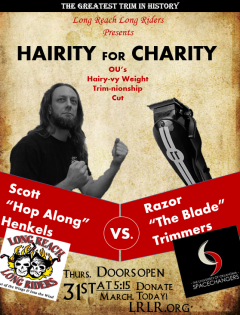 For the first time at OU, Scott Henkels will be losing his locks for charity! Through OU’s Spacechangers and the Long Reach Long Riders, we hope to raise $4,000 by March 8th for three charities and funds. Broadway Cares and Behind the Scenes are supported by the Long Reach Long Riders, a group of theatre technicians and motorcycle enthusiasts who get together every year to ride for charity. We are also raising money for the Steve Draheim Scholarship Fund. Scott “Hop Along” Henkels and Spacechangers have rounded some people up to take part with him, including our very own Tom Orr. You can see the full hair lineup as well as descriptions of our charities below. Broadway Cares is an industry based, nonprofit AIDS fundraising and grant-making organization. Since 1988, they have been raising funds and granting money to AIDS and family service organizations around the country, as well as supporting other AIDS and health related causes. Since their start, they have raised $225 million for those with AIDS and other critical illnesses. This scholarship is award to a promising young Lighting Design major at the beginning of their senior year. There are many ways to donate! If you would like to donate to Broadway Cares or Behind the Scenes, you can do so online. Go to LRLR.org, click donate, and there are links on the bottom of the page. Follow whichever you would like to support, and be sure to indicate that you are supporting Scott “Hop-a-Long” Henkels where it is indicated! If you would like to donate to the Steve Draheim Scholarship Fund, find one of the Spacechangers officers (Dalyn Boyd, Sam Brown, Josh Tyger Walden, Cameron Lazear, or Alex Skaar) and pay in either cash or check.